With over 10 years of activity in the field of Software Testing and Quality Assurance, on all levels (execution, leading, management), covering all types of testing (manual, web...Read moreWith over 10 years of activity in the field of Software Testing and Quality Assurance, on all levels (execution, leading, management), covering all types of testing (manual, web and mobile automated, API and backend testing, performance testing, etc.) and on different industries and types of systems (eCommerce, banking, insurance, medical, security, IoT, embedded, telecom, etc. 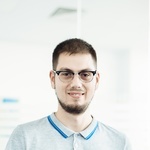 ), Radu also has the formal education to support his extensive hands-on experience in his MsC in Systems Engineering (Computer Science) and ISTQB Advanced, alongside other certifications.